We made our 5 x 8 teardrop trailer easy to build with time and money saving tips and tricks that will help you easily build this teardrop trailer in no time and for less cost. Our plans come with complete instructions and materials list and consists of over 60 pages. Plus you get three other valuable files of information absolutely free as our way of saying thank you for purchasing your teardrop plans from us. A lot of folks prefer to build the teardrop from one of the Northern Tools or Harbor Freight trailer frames (shown below) because by doing so they already have a good portion of the building completed for them and they don't have to worry about having the teardrop inspected in order to get a registration and license plate for it because they already have it. 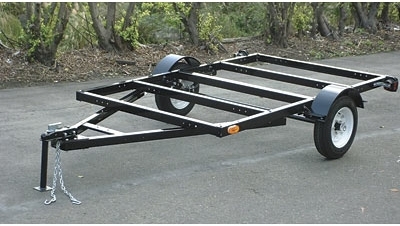 There are a number of advantages to using one of those little trailers for your frame. Besides the ones I have already mentioned, others are that you already have your axle, tires, wheels, trailer lights, hitch coupler, safety chains, fenders and so on. So if you choose to use one of these little trailers for your teardrop, we have included instructions specifically for building the teardrop from one of these trailers. We also included extra instructions for making the frame sturdy and safe in case you get the folding type. Of course we also included the instructions for building the frame yourself if you choose to do it that way. The 5 x 8 teardrop trailer will accommodate a queen size bed or mattress. The plans include everything you need to be able to build the teardrop from start to finish including the wiring diagram with instructions on how to wire your trailer for your inside and outside lights and outlets. The drawings, sketches, photos, measurements step by step instructions and materials list are all together in the plans. The apx. total weight of the trailer once built is around 575 lbs.. So you can pull this little baby behind a Toyota Corolla if you want to and still get good gas mileage. What will it cost to build the trailer? Because the price of materials varies depending on where you live and the fact that lumber prices fluctuate almost on a daily basis, the best we do is to tell you what it cost us to build ours at the time it was built. We built ours for under $699, but it may cost you a little more then that because I am told that the price of the little trailer kit that you will use for your frame (unless you wish to build your own) has gone up since we built our teardrops. And the cost could be a little less or a little more depending on if you choose to use some of the money saving ideas we give you in the plans for where o acquire certain items that you will need. Also just in case you do purchase your plans somewhere else, I want to tell you one more important thing that you need to know. We include this information in our plans but I know that a lot of people do not. Most sellers either don't know or just don't tell you and it is important. If you are going to build the frame for your teardrop, then I'm sure that you know that once you have completed it you will have to get a DOT inspection done so that you can get your registration and license plate for it. Keep All Of Your Receipts For Every Item You Purchase For The Trailer In A Large Envelope and take them with you when you go to DMV to have the trailer inspected, they will more then likely ask you for them. Our plans are easy to read and understand, and we can save you some time and money on the cost of building your teardrop. And when your finished you will have a well built sturdy trailer that looks sharp. The plans and other files are digitally delivered so you will receive them right after your PayPal payment is completed. Our price is very competitive so we hope you will purchase your plans from us. If I have forgotten anything or if your still have questions, you can check our "FAQ" page to see if you can find the answer. And if you cant find the answer, just send us a mesg. from the "Contact Us" page on our site.